I cannot express how large of a crush I have on Night Owl Paper Goods. The designs are adorable, the products are made here in the USA & are eco-friendly! 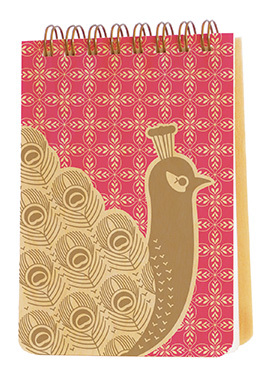 The Peacock Wood Jotter is a fave design of mine because I have a thing for peacocks. I must have a to do list on me at all times so this little note pad is perfect for me or for the student in your life to make sure they keep track of all of their assignments/tasks! Once you are done with the pad you can use the wooden cover and back as a decoration for a craft or! The wood used for Night Owl notbooks. pads, cards and accessories is beautiful. A simple idea with creative designs that are catching to the eye. They describe their style as folksy which for me gives their products such an innocent feeling. Besides the designs you can choose from you can also design your own! This is perfect for events or even if you want to spruce up your children’s school supply arsenal. Night Owl Paper Goods main goals are to conduct business in a manner that encourages and inspires respect for the environment and the community. Night Owl creates their products using environmentally-sound methods and conduct their operations in an environmentally-responsible manner.